The third of Ted Talbot's mystery trio shows a Cauliflower on a train in station. This is by Eric Mason and became 32635 in the A. G. Ellis collection. It shows no. 715 at Ansdell & Fairhaven on a train from Leeds. What comments do members have about the stock, the working, the date and so on? I'm not sure whether the last vehicle has six or eight wheels, but it appears to have an ogee in the centre. As one would expect, there are lavatories for the First class passengers only. In my opinion the train is unusual because often when there are two Thirds and a van at the front they have been added to a standard set, and that set usually has a Brake-end at either end of the train. The LNWR liked brake-ends and had very many of them, but not on this train. As for a date, the lack of lower footboards means post-1901 and the single whistle on the engine means post-1903. The fine and high ballast suggests perhaps pre-War, but I can't get any nearer than that. I don't agree that this is a set (=coupled) train, with or without strengtheners. 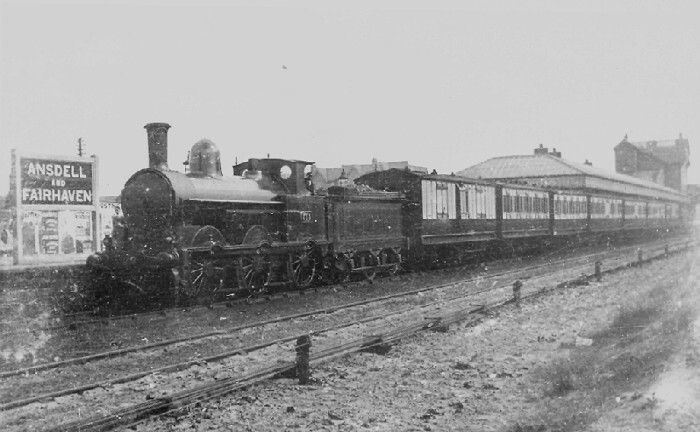 It is a perfectly normal and typical LNWR excursion train assembled ad hoc out of available rolling stock. I agree with Philip that this is not a set train. That is what I thought I had said, but re-reading my message I agree it was not clear. Thank you Philip! According to Wikipedia Ansdell & Fairhaven station is adjacent to the Royal Lytham Golf Course. Might that be the reason for running an excursion there. The British Open perhaps? Does anyone else have a view on the reason for the excursion? The first British Open Golf Championship held at Royal Lytham was in 1926, I understand, which would be many years after the photo at Ansdell was taken.